Songs of Eretz Poetry Review is pleased to present "The Swing They Left" by Carol Hamilton, Poet of the Month. Ms. Hamilton will also be serving as the guest judge for the Songs of Eretz Poetry Award Contest which will run from September 1 to October 15, 2015. A detailed biography of Ms. Hamilton may be found here: http://eretzsongs.blogspot.com/2015/08/songs-of-eretz-poetry-review-poet-of.html. The contest guidelines may be previewed here: http://eretzsongs.blogspot.com/p/songs-of-eretz.html. Fell down because of our exuberance. And the nails were hopping out. That it used to be there. Poet's Notes: This poem was written many years ago when we had just moved into our home where I still live, and my children were still all in elementary school. The family who lived here before had five children, and they left a rickety old porch swing mounted on rusty bars out in the backyard. We had a swing on the porch of an old house where we had lived and been happy in West Virginia, and we gave it energetic use when the children were small. The same did not work so well with this relic of others’ exuberance. This little poem speaks of passing things, ruination and loss, life cycles, and how we must and do move on. 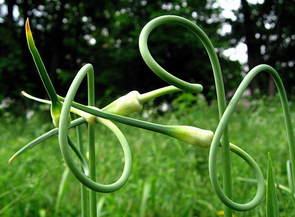 Yet each year I love the return of the garlic heads going to seed with their graceful twisting necks and swan-like pods. They represent continuity in the presence of change and loss. Editor's Note: This poem reminds me of the swing in the backyard of my childhood home in upstate New York. I spent many hours on that swing, often alone with my thoughts, but more often along with my little brother and occasionally with other children from my neighborhood. It has been many years since I visited my childhood home. I don't know if the swing is still there, perhaps waiting in vain for grandchildren too old now to enjoy it. I like the way the poet uses the garlic as a metaphor here. For me, it stands for the memory of the prior owners of the home, something permanent that they left behind them--a memory bitter like garlic, yet savory in the literal and figurative sense (to be savored). "The Swing They Left" was originally published in QUOIN.